Likewise, had it not been for blogger Gabrielle Blair’s mention of reading Global Mom in late 2013, I would not have sought out Melissa Dalton Bradford’s book of that title nor would I have gotten to interview her here on Intentional Mama a few months later. I’m grateful for authors like her who write honestly from their experience, especially when their words spring from a place of grief and growth and healing. Peter Mayle’s witty synopses of his years in Provence brought countless tourists to the region, inspired a television series and a movie (The Good Year starring Russell Crowe and Marion Cotillard), and even earned him a Legion of Honor. In this final essay collection he muses on these events and the ensuing changes in Provence with his trademark duo of humor and humility. My Twenty-Five Years in Provence was published posthumously (after his death this past January), as such it is a bittersweet and fitting tribute to the life of a man who was one of the top travel writers of his era. It’s a quick read and shares some funny insights on topics as diverse as Russell Crowe, buying property in Provence, choosing a French restaurant, and on unknowingly having his obituary prepared. Mayle was keenly aware of how Provence changed largely due to the popularity of his books, but he also knew that his books gave him the means to enjoy Provence during the final years of his life. Here, his final essays reflect that contentment with simplicity and gratitude. 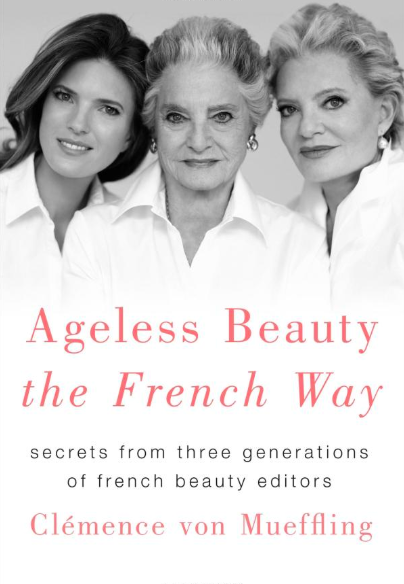 This title from Clémence Von Mueffling is marketed as “an unparalleled guide to every French beauty secret for all women.” This book falls quite a bit short on that account as it’s a rather quick read, but from the perspective of a makeup minimalist like myself, it is interesting to hear from three different generations of women about their favorite beauty tips and French products. I did learn some air travel tips for skin care worth remembering, and it did convince me that there are indeed some products that are worth using from time to time. Most of all, I appreciated the perspective that beauty can be enjoyed as a thoughtful, daily emphasis without it becoming a personal fixation. This was my favorite read this summer: Pancakes in Paris is an entrepreneurial tale in which Craig Carlson recounts the oddly fascinating story of how he established his two Breakfast in America diners in France. Carlson has a dark, self-depreciating sense of humor which leads readers past his heartbreaking childhood, through an innovative period of fundraising, and over the stress-inducing hurdles he had to overcome before opening the doors to his first diner in 2003. Carlson is a surprisingly talented writer, and his tale will have you rooting for his diner’s success while you raise your eyebrows at the French business laws that drove Carlson batty. I learned quite a bit about French employment laws from this book—information that Carlson mostly learned the hard way. For those of you living in Paris (or who know someone who does), spread the news that Carlson will be a keynote speaker this October at Bloom, an event to help English-speaking foreigners get established in Paris. Lindsay Tramuta’s writing seems to find me wherever I am: on a cross-country flight I encountered her article about finding her style; back in Oregon my mom clipped one of her articles on Lyon; even my local library recently had her book The New Paris waiting on my hold shelf just before our departure to France. Tramuta is a contemporary American writer living in Paris and writing about many of the topics I love (travel/food/life in France), so it’s no surprise that I continue to embrace her work. The New Paris is a beautifully photographed collection of feature articles on Paris’ newer shops, cafés, and addresses worth discovering. This book is for those who enjoy the comfort and instant satisfaction of glossy images and armchair travel, but it’s also a true reference guide for discovering some of the newest innovative small businesses in Paris. The world needs more independent, motivated, and productive writers like Tramuta. I just checked her blog, Lost in Cheeseland, and her latest post lists New Books about France for Summer and Fall 2018. I knew we thought alike! What books or articles have you enjoyed reading lately?